Double Chocolate Microwave Brownies - Fudgy, chocolate deliciousness microwaved in a flash. The perfect cake, pudding, dessert, gift or treat, these are the real deal. Break up the chocolate into chunks and put into a large microwaveable bowl. Add the butter and sugar and microwave until melted together. On MEDIUM microwave heat this will take 3 - 4 minutes, depending on your microwave. It's important to stop every 30 seconds to stir. Whisk in the flour and then the eggs, followed by the chocolate chunks. Pour into a greased microwave proof dish. Leave to stand for 15 minutes before cutting. 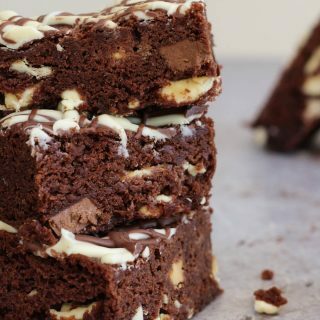 While the brownies are cooling, melt the white chocolate in the microwave. On MEDIUM microwave heat this will take 3 - 4 minutes, depending on your microwave. It's important to stop every 30 seconds to stir. When melted, drizzle over your brownies. When they have been standing for at least 15 minutes, cut into chunks and serve.